After the 2008 crisis, the financial industry has become much more blurred and connected to other sectors. One of these is technology, which is gaining a predominant role in everyone’s lives. The result is Fintech, which is very likely to be the future of the financial world. “Fintech is not only an enabler but the driving engine,” said Pierre Gramegna, Luxembourg’s Minister of Finance. Ant Financial is not only the best example to fully understand the aforementioned statement, but also one of the most scrutinized companies, due to its incoming IPO and its battle for China market share against the payment arm of the rival Tencent. Overall, as the KPMG and H2 Ventures report “Fintech100 - Leading Global Fintech Innovators” maintains, this firm is the strongest fintech company. In addition, it comes with no surprise that 5 firms of the top 10 are located in China, the most active country in this sector. What is this fintech firm involved in? Ant Financial was founded in 2014 through a spin-off from the Alibaba Group (NYSE:BABA) and originated from Alipay – the world’s leading third-party payment platform. Today, Ant Financial runs Alipay, Ant Fortune, Ant Financial Cloud and other financial services. Together they cover wealth management, credit reporting, private banking, payments and cloud computing. With $230bn in AUM, the company owns the world’s largest money market fund. It controls one of the largest credit scoring systems, collecting data on its hundreds of millions of users in China. 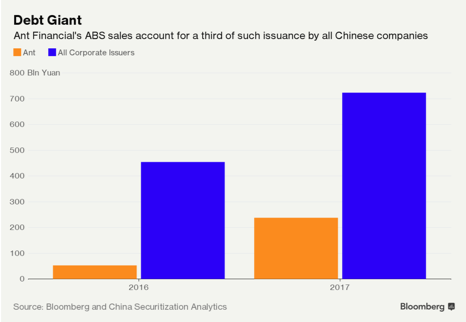 Ant has therefore become a financial giant that was said to be valued at $60-150 billion (up to 50 percent bigger than Goldman Sachs) and currently has more outstanding consumer loans than China’s second-biggest bank. The Hangzhou-based company has evolved from the Alipay payments business into money market funds and micro-loans. It is said to be preparing to launch a $9bn private fundraising round ahead of its much anticipated initial public offering, according to people familiar with the firm. 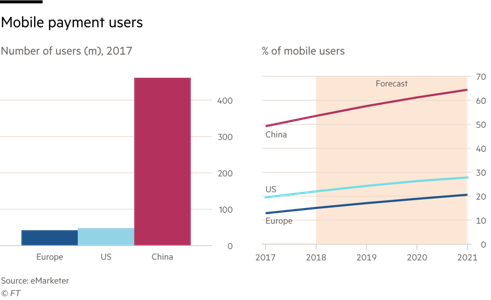 Ant Financial’s history also demonstrates the way that China, the world’s second-biggest economy, has embraced the shift towards a cashless society more enthusiastically than Europe or the US. Consumers used Alipay last year to make $8.7tn in payments, according to Barclays. Ant Financial is now one of the backbones of consumption in China. Including its rival Tencent, the two companies make up more than 90 per cent of the country’s $16tn annual mobile payments market: in Beijing, Shanghai or Shenzhen, young people seldom use cash to pay for coffee, fast food or even daily groceries. Instead, they scan two-dimensional QR bar codes with their phones that process the payment via Alipay or Tencent’s WeChat Pay. The company benefits by being part of the broader Alibaba empire, one of the e-commerce leaders. Since 2009, Alibaba has held Single’s Day, a digital shopping festival to promote spending on the company’s online mall, called Taobao. In last year’s edition, online sales approached $25bn in just 24 hours. Those sales are conducted on Alibaba’s shopping platform, but the payments for most of the purchases are made through Ant Financial. Analysts describe Alipay as “the glue that holds together Alibaba’s online shopping empire”. This company is much more than a mere payment platform: it is also a lending institution. It extracts data from users across its spectrum of businesses, including information about what users buy, who repays debts and which clients save more than others. The data is analyzed by the company’s lending platforms, which give loans to both consumers and small businesses. By better understanding their customers, analysts say Ant Financial is able to make more profitable lending decisions. Loans nowadays amount to more than 600 billion yuan ($95 billion) despite the affiliate of Alibaba Group is facing a tougher regulatory environment: in China it is harder for online finance companies to issue ABS, complex financial products that repackage debt to be sold to investors.